This Express Vertical Flap-Over Shoulder Bag is a deluxe shoulder satchel bag ideal for anyone who is an avid tourist. With plenty of compartments and pockets to keep your essentials neatly organized, this is a wonderful companion bag to carry anywhere you go! Superior stitching and interior cloth plaid lining make this a truly stylish and elegant satchel that is delightfully charming. 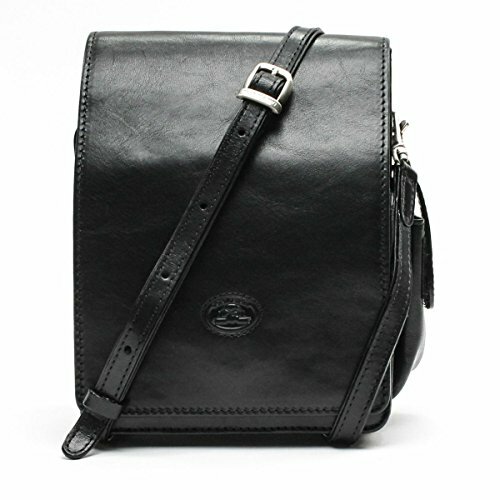 Comes with a 0.5" detachable and adjustable shoulder strap. Features a large top compartment, front narrow zippered compartment, front zippered pouch with small pocket, two side Velcro snap pockets, a rear zippered side pocket, and belt look attachment. Dimensions: 7.5"(L) x 5.5"(H) x 3.25"(W). Weight: 2lbs. This Express Vertical Flap-Over Shoulder Bag is part of our Tony Perotti Italico leather collection, made from Italian adult Bull hide Full Grain leather, providing a durable, stronger and longer lasting leather that is smooth to the touch with a shiny glossed finish. The cool Italian weather prevents any flea or tick irritation to the animals attributing to the top quality and purity of the leather, devoid of any scratches or bites on the leather. Tanned in a heavy coating of different eco-friendly vegetable oils to prevent everyday scratches and blemishes, the natural surface of our full grain leather burnishes and beautifies over time.Our Tony Perotti products are backed by a limited lifetime warranty. Please contact the Distributor Tony Perotti USA. Features a large main compartment, front slim zippered compartment, front zippered pouch with small pocket, two side velcro snap pockets, and rear slim zippered pocket. Flap-Over with Magnetic Snap Closure. Interior plaid lining. Comes with a belt loop attachment. Comes with 0.5" detachable and adjustable shoulder strap. Comes in signature Tony Perotti lint bag for storage. Dimensions: 7.5"(L) x 5.5"(H) x 3.25"(W). Weight: 2lbs. Comes with Limited Lifetime Warranty. If you have any questions about this product by Tony Perotti, contact us by completing and submitting the form below. If you are looking for a specif part number, please include it with your message.